*This is the second in a series of posts from Katherine Carter, founding principal of Manzanita SEED and GO’s Doctoral Resident in Education Leadership. Katherine is working on a community-driven design process to open Oakland’s first dual language middle school and multilingual high school. This second installment focuses on the work being done in Oakland to open dual language and multilingual middle and high schools. Adriana, 8, has a dream. Families, students, clergy, district staff, and elected leaders celebrated another step toward making Adriana’s dream and other bilingual students like her, a reality on Monday, May 9, at St. Jarlath Church in Oakland’s Fruitvale district. The community celebrated the expansion of dual language and multilingual education in the Oakland Unified School District (OUSD). Student leaders Isabel Park and Nasir Abram (pictured above) and the dual language middle school design team emceed the community celebration of bilingualism and multilingualism. 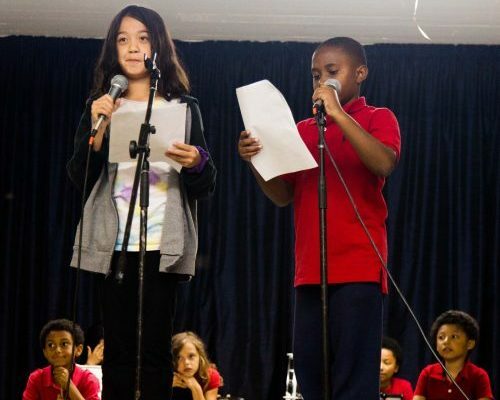 Recognizing the importance of dual language, OUSD’s 2015-2018 Roadmap for English Language Learners’ Achievement calls for the expansion of dual language programs and the creation a PK-12 dual language pathway, and in 2015, the district issued a Fall Call for Quality Schools with dual language as one of the four focal areas. The Fall Call is supporting Melrose Leadership Academy, International Community School and Greenleaf K-8 to expand or implement a Spanish-English two-way immersion program. In addition, a design team that grew out of Manzanita SEED is proposing a new, dual language immersion middle school opening in 2017 to serve students from SEED, ICS, CUES, and other elementary schools. 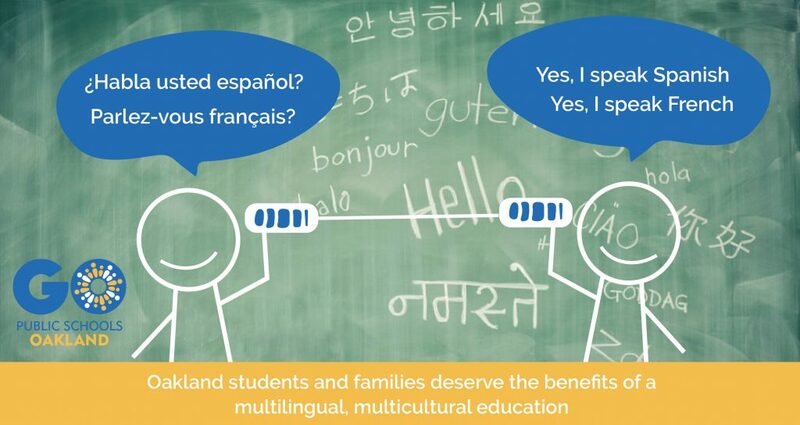 Dual language immersion and multilingual programs benefit all students, by providing them with the academic, sociocultural, and cognitive benefits of bilingualism I discussed in my earlier blog post. In addition, multiple studies indicate that dual language programs are the most effective program for students who are learning English. In fact, students who maintain their home language through dual language programs begin to outperform monolingual, English-only students in middle and high school when they continue to receive academic instruction in their home language. While Oakland has many dual-immersion bilingual elementary programs, there is currently only one middle school program, at Melrose Leadership Academy, with limited space. There are not enough seats in middle school to accommodate the students from existing elementary school programs, and there are no public high schools in Oakland that focus on supporting students to achieve and maintain high levels of learning in multiple languages. 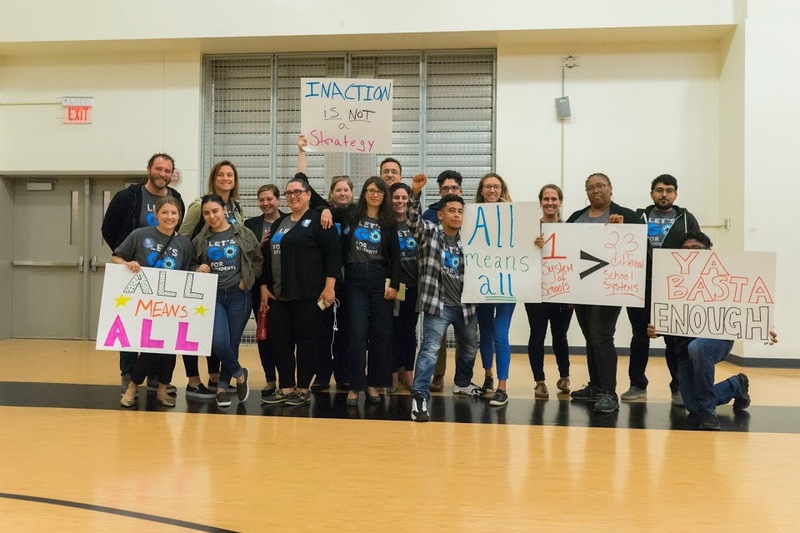 The next step toward creating this pathway in Oakland is to extend existing Spanish two-way dual language immersion programs into middle school and plan for a multilingual high school program. Oakland students and families deserve the benefits of a multilingual, multicultural education. Attendees at the event included OUSD Superintendent Antwan Wilson, OUSD Chief Academic Officer Dr. Devin Dillon, OUSD Board President James Harris, Board Directors Roseann Torres and Nina Senn, and City of Oakland Education Director David Silver.